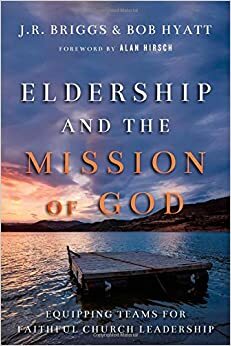 J.R. Briggs and Bob Hyatt have teamed up to write a book on elders in the context of being a “missional” church. (I am not even going to pretend I know what that word means. I’ve tried. I’ve failed. Just go with it.) The book is Eldership and the Mission of God: Equipping Teams for Faithful Church Leadership. While I will never get the term “missional”, I do know that when I generally read books by “missional” pastors, they resonate with how I see ministry and mission within my community. This book is wonderfully simple. It is a “quick read,” but don’t leave it as simply that. Refer to it again and again. Visit the biblical underpinnings of eldership in their explanations. Understand how they developed the roles of elders within their own contexts. When you are working on how to form a team of elders, pull this book out again. Mark it up. Don’t dog-ear it. I hate that. Use post-it notes or something. Respect the page! This is about biblical journey. It is about life journey. It is not about structure for the sake of structure. It is learning to build long-term relationships that root the church deeply in the community and disciple believers to change their world. We want to do so much more than simply “get people saved.” It’s more than getting them “ready for heaven.” We need to equip people to bring heaven to earth as we live. It is a powerful calling. This is a good basic manual that is worth visiting again and again. For me, it serves as a possible “thank you” gift to the team I serve with because they model so wonderfully what this book lays out. For new church plants, this is worth visiting as you dream about good leadership structure. We need ALL the gifts in the church! We need ALL the gifts possible in leadership. It can’t be a one-man show any longer. This is a great tool for taking us to true team leadership. I was sent this book by IVP for review. I am under no obligation to write a positive review. Hey! Thank you so much for an excellent review! The IVP folks are telling us we need some Amazon reviews. Amazon won’t start promoting until we get between 15-20 reviews. Would you consider posting this there?